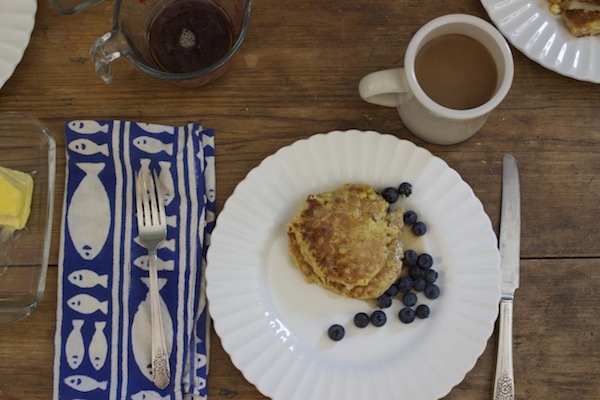 Sunday mornings at our house in August and September usually mean corn fritters. This is when Maine corn is at its best. From the early Spring Treat through the late Silver Queen, the varieties just get better and better as the weeks go by. We don't grow corn in our garden—we don't have the space, and frankly, I don't have the energy to fight with the raccoons over it—but I usually buy it every Tuesday, Friday, and Saturday at the farmers' market. That means corn on the cob on Tuesday and Friday nights, and corn fritters with butter and maple syrup on Sunday mornings. Does it sound like we're stuck in a rut? Well, it's a very nice rut! I recommend it. 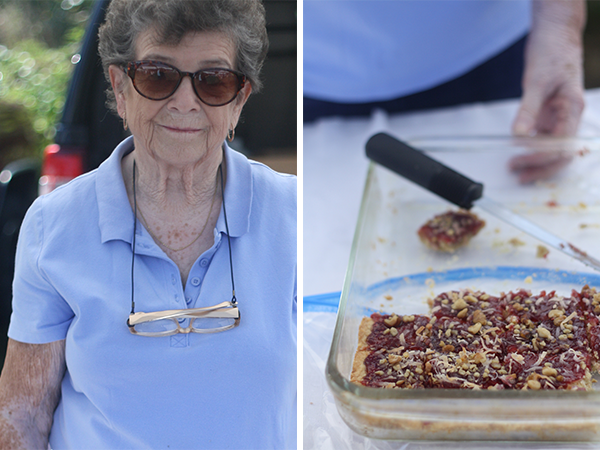 The recipe I make is the same one my mother, and probably my grandmother, made. We're not talking anything deep-fried here. These fritters are just pancakes by another name. They're little pillows of fresh, sweet corn with just enough flour and egg to bind the corn together. There's nothing special about the recipe itself. It's a snap to make, and it requires only 5 ingredients—two of which are salt and pepper! What's special about corn fritters is that they really are a seasonal treat. I wouldn't think of making them with canned or frozen corn. That means we have about 8 weeks, tops—if we're lucky—in which to enjoy them. I got started on this year's "frittering" two weeks ago, with Sunday brunch at Anna and Andy's house. I plan to keep it up for as many more Sundays as the corn holds out. This recipe calls for 2 cups of corn, but don't feel you need to be spot-on with this measurement; a little more or a little less isn't going to matter. I've made these with both white flour and whole-wheat flour, with equally good results. When using whole-wheat flour, though, I use just a tad (maybe about 1 tablespoon) less than the 1/4 cup called for here. 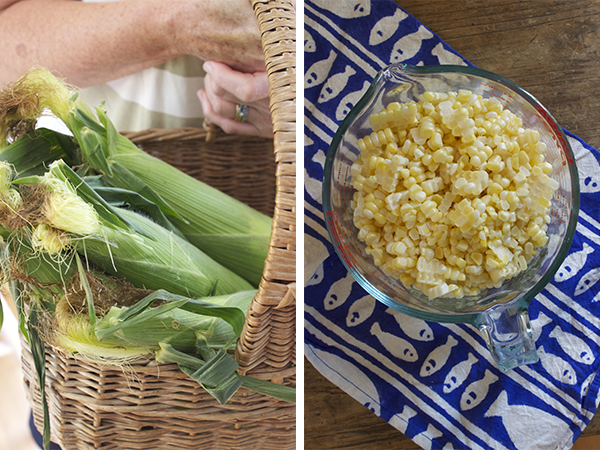 Using a medium-sized, sharp knife, carefully cut the kernels off the corn cobs. It's easier to do this if you lay the ears flat on the cutting board, rather than standing them up. Don't worry about separating the kernels, which usually come off in chunks (see the photo above); this will happen naturally when you mix the batter. 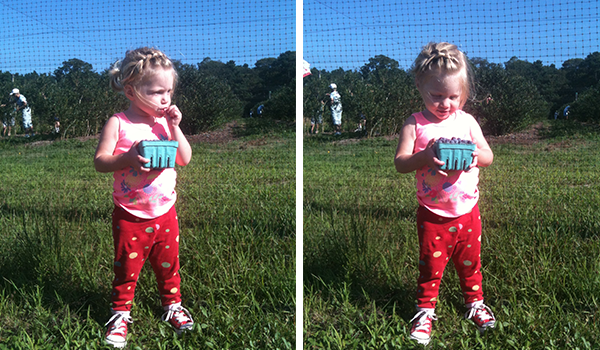 Set the corn aside. Separate the eggs. Put the egg yolks into a medium-size mixing bowl and beat them lightly with a fork. Add the flour, salt, and pepper and stir, then add the corn and stir again—just enough so that everything is nicely mixed together. Beat the egg whites until stiff and then gently fold them into the batter. Heat your griddle or frying pan to medium hot, oil it lightly, and then drop pancake-size dollops of batter into the pan. Cook about 2 minutes, or until you start to see little dimples forming on the top of the pancakes, then flip them and cook another minute or so. Serve warm with butter and maple syrup. Hi. I have to work a double today and it's hot and busy and August but I just wanted to drop by and say I hope you're eating tomatoes. We're not having a particularly productive tomato year in our garden—we would not, in fact, be having a tomato year at all if it weren't for our kind neighbor George, who brought over some seedlings in late May after I forgot to start mine in April. But while there will be no sauce for the freezer, we have plenty of tomatoes for right now, for slicing and dicing and salads. We've been eating sliced tomatoes with mozzarella and basil and balsamic and roasted eggplant with tomatoes and feta and zucchini. And this morning, Sally and I had chopped tomatoes with olive oil and garlic on toast. I first had pan tostado con tomate y aceite for breakfast in Spain my sophomore year of high school, and I've made it every summer since. If you haven't tried it, do. I hope you've got tomatoes coming your way, and I hope things are good. I'll see you soon, friends. Sometimes I'm amazed at how much I still have to learn about vegetables and gardening. Take these Ailsa Craig onions, for example. I'd never heard of them until we started getting them in our CSA share a few weeks ago. They're almost the size of softballs—and at least as heavy! 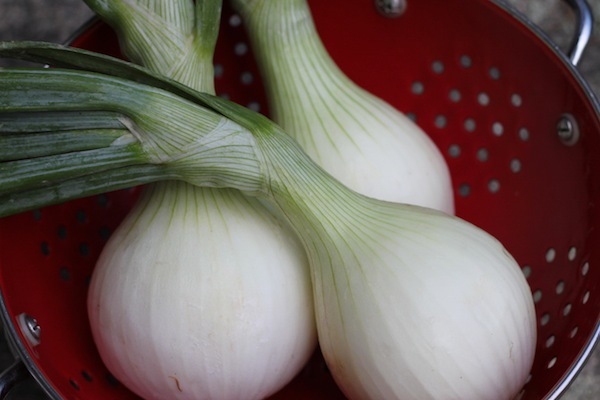 I now know that Ailsa Craigs are the north's answer to Georgia's Vidalia onions and to Washington's Walla Walla onions. This large, sweet heirloom was introduced in 1877 and is named for a small island off the west coast of Scotland. It's adapted for 38–60 degrees latitude, which is basically the northern half of the U.S. and into Canada. From what I've read, two-pound Ailsa Craigs are easily the norm, and even five-pounders are not uncommon. From personal experience, I can also tell you they're delicious—even raw or barely cooked. And more good news: they keep well in the fridge for at least three weeks. As soon as I saw these beauties, I knew exactly what I wanted to do with them. I pulled out my recipe for Walla Walla Onion Pie, written down for me by my dear friend Genie, who grew up in Seattle. 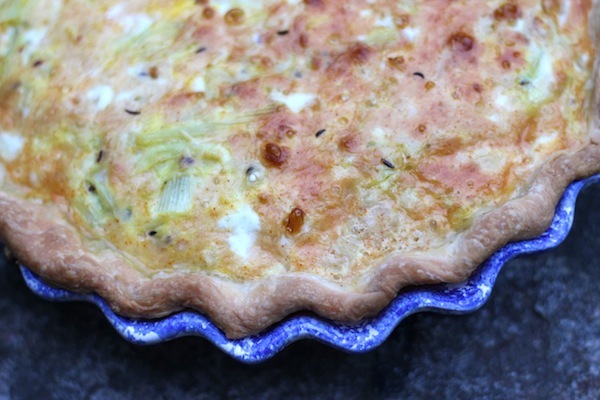 The caraway seeds is this delectable quiche are an unusual and distinctive addition. I don't want to tell you what to do, but my advice is not to leave them out. Genie mixes the caraway seeds in with the flour when she makes her crust. I've done that too, but you can also mix them in when you sauté your onions. The caraway taste in this pie is fairly subtle, so you might try using 1 1/2 tablespoons and dividing them between the crust and the onions. You can make this recipe with any sweet onion, of course. Since we live in Maine and not Seattle, however, I can't in good conscious call this Walla Walla Onion Pie. 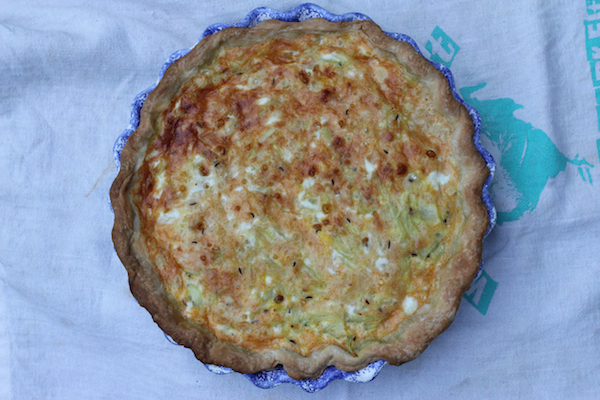 So here it is, Ailsa Craig Onion Pie. Thanks, Genie! Like most quiches, this savory treat is good for breakfast, lunch, or dinner—and maybe even better as a cold leftover. I like to let any quiche cool for at least 10 minutes after I take it out of the oven. It brings out the flavor better. Line a standard-size pie plate with the crust and set aside. In a large skillet or shallow kettle, melt the butter over medium heat and sauté the onions and caraway seeds until the onions are nice and soft. Let this mixture cool slightly and then spread it on top of the pie crust. Combine the flour, salt, paprika, cheese, eggs, and milk. Mix well and then pour this over the onions. Another pinch of caraway seeds makes a nice topping. If you're into bacon, you can also sprinkle some of this on top—as Genie wrote on the recipe card she gave me, "Yum!" Bake at 400 degrees F. for 30–40 minutes, or until the eggs are set and the top is nicely browned. Let the pie cool for about 10 minutes before cutting and serving it. August means shorter days and cooler nights. It means my last month without school before a new semester starts up. This time of year always makes me feel nostalgic for summer, even though there is another month or so left of it, and I find myself scrambling to take advantage of the warm days. 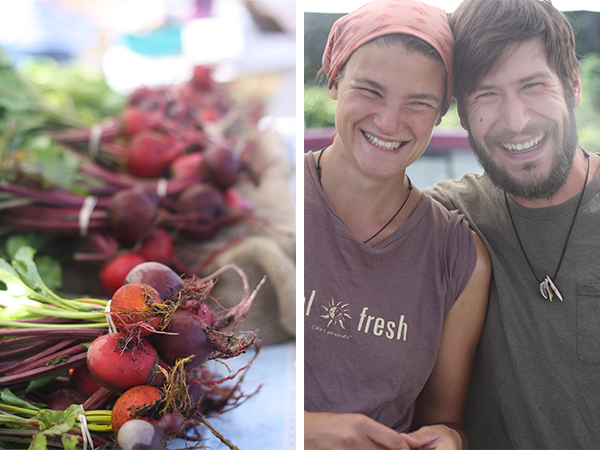 Luckily, August also means the peak season for local produce. I debated for a while about what to do with these beautiful berries. 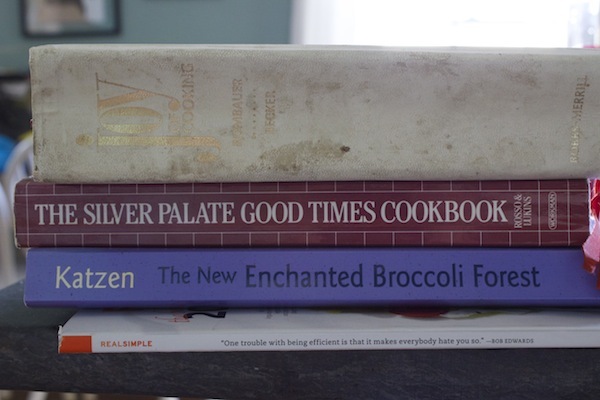 I looked through all of my favorite cookbooks and ultimately decided on a recipe for blueberry corn muffins from the Silver Palate Good Times Cookbook. Muffins seemed like a safe, although somewhat boring choice, but for these berries I'm so glad I decided to go the muffin route. 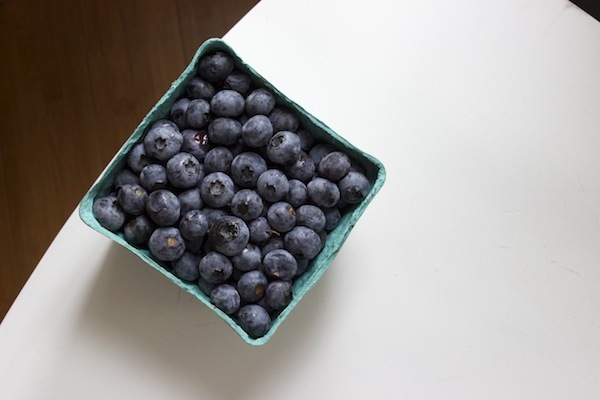 Large, high bush blueberries are perfect for baked goods because they form little berry bombs that make each bite perfect. 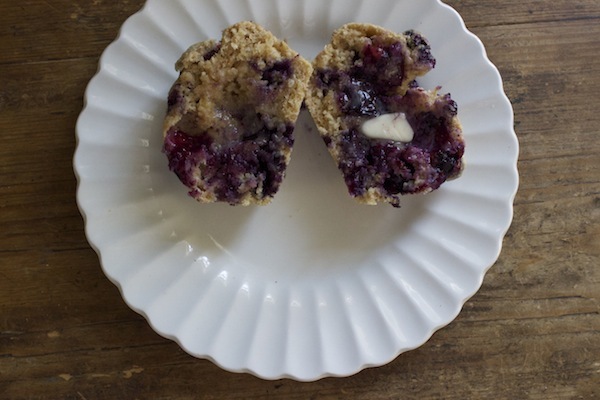 It's hard to resist eating these muffins straight out of the oven with a pat of butter. After deciding on this recipe I realized that I had no corn meal, so I used oat bran instead with excellent results. Preheat the oven to 400 degrees. Line muffin pans with muffin papers or oil the muffin pan well. Mix the dry ingredients in a large bowl. Make a well in the middle of the dry mixture and add the buttermilk, olive oil, yogurt, and egg. Stir until ingredients just come together. Fold in blueberries. 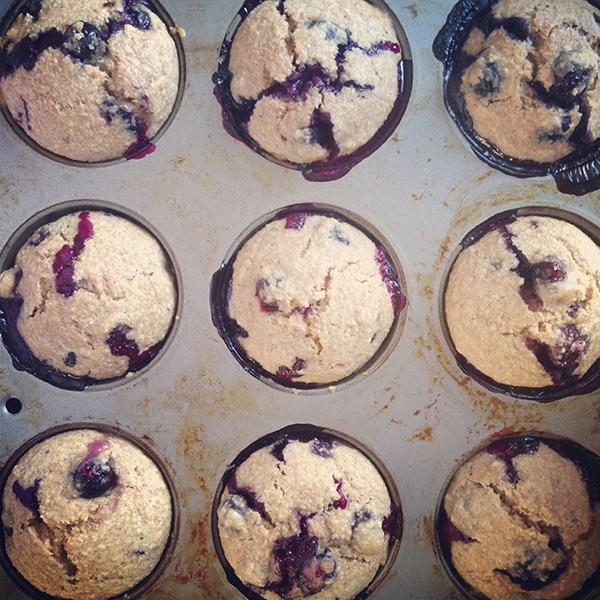 Fill each muffin tin about three-quarters of the way with batter. Bake for 20-25 minutes.